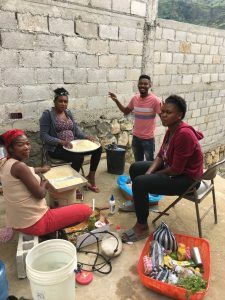 Creole is the native tongue in Haiti. All the other languages that I fluently speak like German, Spanish, Greek and English just get in the way of trying to learn another one. Of course none of us speak Creole, so it’s been both fun and frustrating at times. The mission house is our base camp up in the mountains (4000 Ft). By Haitian standards it’s a fairly nice residence and has a real communal feel to it as the doors are always open and a variety of Haitians come and go. As far as I can tell there are 4 people who live at the mission house, “Tee-Paul” a 30 year old Haitian, “Franz” who is 25, “Son-Son” a 15 year old Haitian boy and “Nalto” a 4 year old orphan boy. And all three sleep on the floor on mattresses like the rest of us. The three of them are like family to one another to the point where 4 year old Nalto calls 15 year old Son-Son his daddy. Yesterday we started our teaching and day two of the conference was today. Each day gets a little more crowded as more pastors arrive and the teaching gets a little more comfortable with a translator for both the teachers and the listeners. We have found the Haitian people to be a wonderful people, a proud people and yes a needy people. They have next to nothing but understand fully where their joy ultimately comes from – it’s not in the material but their joy is in the Lord.